Christel Boeljon, who recently turned pro after a collegiate career at Purdue, is looking forward to that professional career by taking part in the Ladies European Tour qualifying tournament. In fact, Christel won the First Stage qualifier that finished on Sunday in Spain. Christel posted rounds of 69-74-65-68, a total of 12-under 276, to finish two strokes clear of Anna Nordqvist and Julieta Granada. Now it's on to the Final Stage, which begins Monday (Jan. 11) and concludes Thursday. The Top 30 finishers there earn the equivalent of full playing privileges, and the next 20 get conditional status. Christel is a Dutch girl from the city of Beverwijk in The Netherlands. 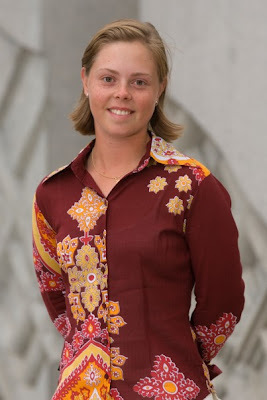 Before leaving home for the American college life, she won the 21-and-under matchplay national championship in 2003 and the 21-and-under strokeplay national championship in 2005. She was Big Ten Freshman of the Year in her first season at Purdue, and was a consistent high performer in the following seasons - including a runner-up finish at the 2007 NCAA national championship and scores of Top 10 finishes.